In December a nice lady came into the shop asking if I could reproduce (without a pattern) the Christmas stockings that her Grandma made. I told her I'd be happy to do it after the holidays. On the left are the two I made for her. I love the cute bearded Santa! Now all I have to do is knit one up for myself and write the pattern so others can make this cutie. Santa's face is done in intarsia. Most people shy away from it because it's, as I like to say, annoying. 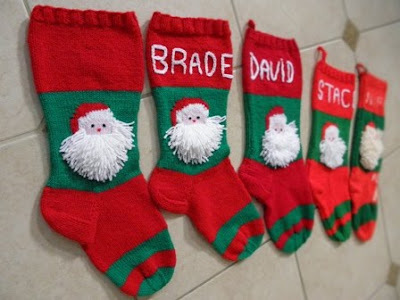 But, on this project the intarsia is just a small portion of the stocking and well worth the trouble. The beard is just fringe...I'd like to see it in a fuzzy angora. How about you?